Located 20 km from Mangaluru, Vamanjoor is a small, quiet community, perched at an average height of 30 metres above mean sea level. Yet, situated in its midst is a college campus, spread over 45 acres, with a commanding view of the landscape and its idyllic surroundings. 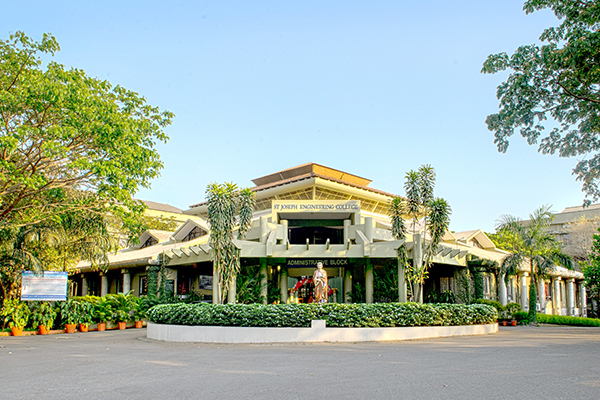 Named after its patron, St Joseph Engineering College, Vamanjoor, Mangaluru, came into existence on 23 September, 2002. Conceived with the intention of making professional education a reality for underprivileged students, who yearn for a better future, the Diocese of Mangalore under the leadership of the Bishop of Mangalore, Most Reverend Dr Aloysius Paul D’Souza, took the initiative of setting up an engineering college. Approved by the All India Council of Technical Education (AICTE) and affiliated to Visvesvaraya Technological University (VTU), Belgaum, the College has since established a reputation for technical education in the Dakshina Kannada region. Undergraduate students have a choice of five core branches in engineering, which are, Computer Science & Engineering, Civil Engineering, Electrical & Electronics Engineering, Electronics & Communications Engineering, and Mechanical Engineering. Furthermore, post-graduate studies include M.Tech., M.B.A., M.C.A., and M.Sc. in Engineering by Research, and Doctoral programs in Basic Sciences (Physics and Chemistry), Mathematics, Engineering (CSE, ECE, EEE, ME), and Business Management. Also, as a religious minority institution SJEC provides opportunities to deserving students of all communities, and Christian students in particular, by offering selected scholarships to meritorious students. The institution has consistently secured very high academic results and the college is justifiably proud of its students having achieved Ranks in University exams over the years. The college has also secured the coveted NBA Accreditation for its engineering programs of Computer Science and Engineering, Electrical & Electronics, Electronics & Communications, and Mechanical Engineering for the duration 2013-2015. Along with regular academics, training programmes to develop soft skills of students are conducted in association with professional trainers, such as, I Point. Value Education Classes are made as a part of regular curriculum to develop a strong moral and ethical sense among the students. Over the years, institution has seen a significant rise in the number of Faculty with Doctoral degree in each of the Departments. The institution has set up eight VTU approved research centres across various Departments, and are, currently producing good research outcomes in terms of publications and Doctoral degrees. Mechanical Engineering Department has recently secured a VGST grant of 20 Lacs from the Government of Karnataka. The Department of Physics has also secured a research grant of 14.76 Lacs from the Department of Atomic Energy, Government of India. In addition, support courses and tools facilitating research, such as NI LabVIEW, Cadence, and CATIA, etc. are offered to students to promote research. To be a global premier Institution of professional education and research.